What’s the one room where friends, families, or partners join in a meal together? The dining room! Being such an important part of making your new house a home, there should be thought and time put into decorating it! Here are a few ideas for accents you could add to make your dining room an area where people love to be. Curtains: If your dining room is close to windows, why not incorporate the lighting and frames into your atmosphere? Adding long, flowing curtains to a room can make it appear much brighter and open— another option could be adding not-as-flowing, but warm colored curtains to give the room a comfortable and close vibe. For privacy, you can close them, and you can always open them up to let light in on a family meal— curtains are a great, versatile aspect that could be added to your dining room! Wall Accents: Typically, the dining room is a place where many different types of people join together in communion— why not give them something interesting to look at? One option is art— go to your farmer’s market and buy some local artwork to display on your walls! Another option could be family photos, for the dining room is a place typically where family joins together and eats. Why not display your best memories together? Wall accents and decorations are a great way to liven up your dining room. Interesting Furniture: A more unique approach to making your dining room even more fun and spunky could be by having your dining table and chairs a piece of art themselves! 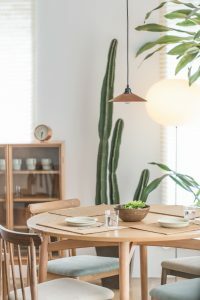 If you enjoy the modernist trend, you could purchase metal or glass tables that aren’t very traditional— even taking inspiration from dining sets of different eras, such as the 60’s, could give your dining room a unique charm.